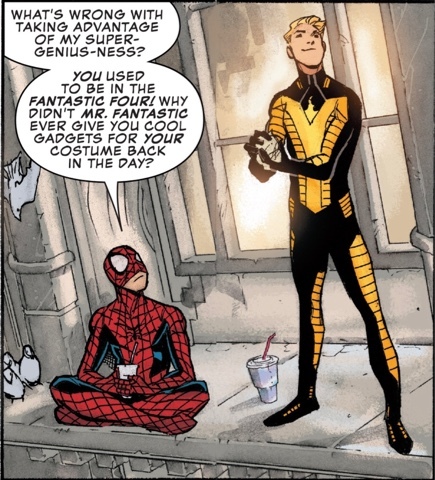 Peter Parker, the Spectacular Spider-Man, is having lunch with old pal Johnny Storm. They're just passing the time, telling one another things they know they know, in the way super-heroes do in the first issue of a new series. 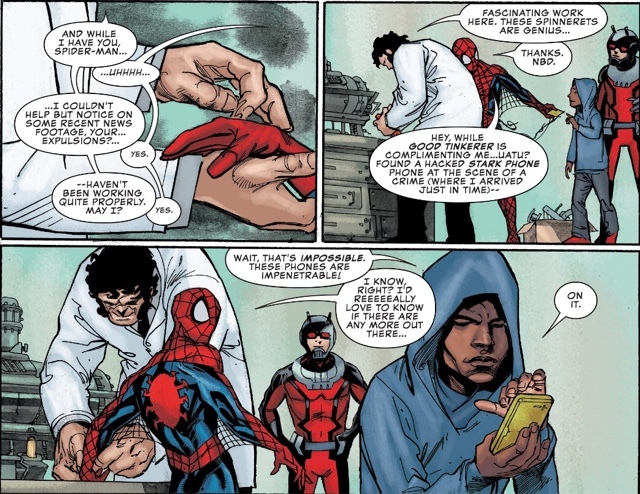 Johnny leaves and Peter stops a robbery, with some unexpected aid. 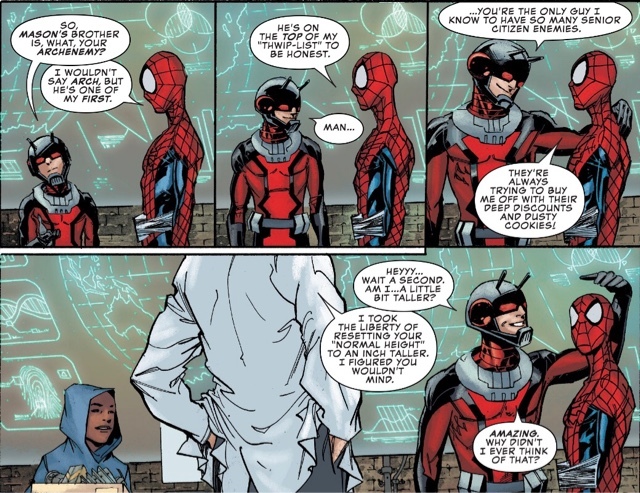 Who says spiders and ants don't get along? 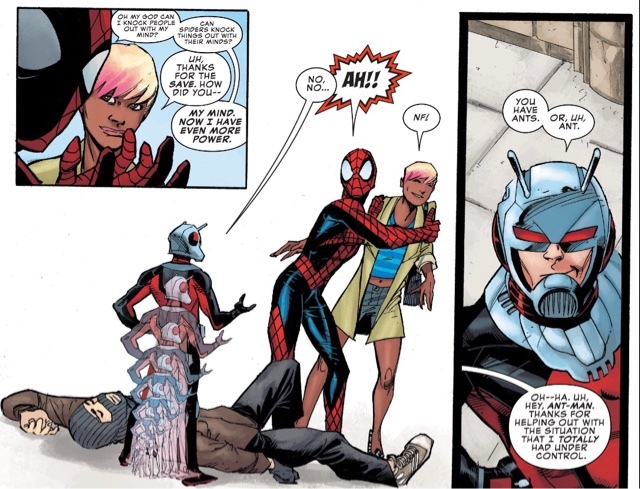 The young woman Ant-Man and Peter have helped, Rebecca, is rather attracted to Spidey. Chicks dig the cowl? The Mason helps Peter with a webshooter problem he's been having, and while he's grateful, his attention is focused on a mystery. And there you have the bare bones of a very entertaining first issue from writer Chip Zdarsky, artist Adam Kubert and colour artist Jordie Bellaire (there's no letterer listed, but Kubert did start out on the calligraphy side of comics, so maybe he's keeping his hand in). The dialogue is witty without being grating, new characters Rebecca and The Mason display instant charisma, and who doesn't love it when Johnny Storm visits Peter? Mind, i didn't recognise him until his name came up - this is what the Inhumans make him wear? Didn't the Terrigen Mists give anyone style powers? I'm not saying Kubert draws a bad Johnny Storm, it's just that if he's not clad all in blue or lighting up, he could be any one of Marvel's multitudes of good-looking blond chaps. Kubert doesn't draw a bad anything, and he essays an especially nice Spidey - lithe, dynamic, occasionally too lumpy in that Humberto Ramos way, but basically very likeable. The opening spread is madly vertiginous, it must have taken hours, while The Mason - real name Hophni, brother of Phineas, because someone's parents had a bible - is an interesting design; I like that no one mentions he's pretty much a giant, because why would you? Kubert deftly gets the point across by having him break out of panels, or not quite fit into them. There's a new Spider-Man film coming out featuring a young Peter Parker, not the hi-tech billionaire of Dan Slott's Amazing Spider-Man series. So here's a book that acknowledges Peter's current status as head of some Stark knock-off, but only barely. Peter even pretends to himself he's not rich, saying he'll have to cash in his air miles to take a trip to Chicago. The book opens with Peter admitting he misses being friendly to his neighbours and proceeding to tackle a nice, traditional Manhattan mystery. 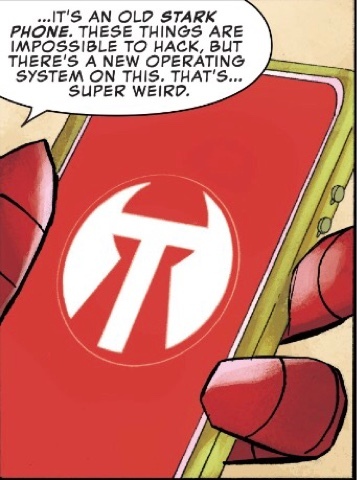 I don't get why Peter is quite so excited about a phone being hacked, but that's the Maguffin operating system for you. 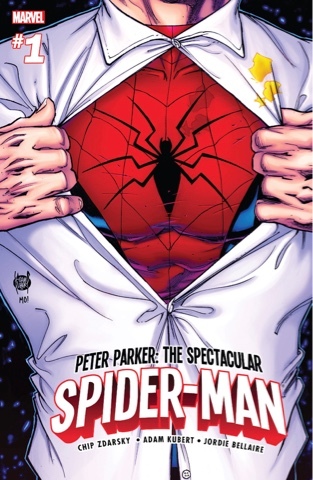 As someone who jumped off the Slott series awhile back - it's very well done, but not for me - I appreciate Marvel putting out a back-to-basics Spider-Man book. This has the feel of Seventies and Eighties Spidey but with the zappier dialogue of today. And terrific footnotes Whether I'll buy it monthly - Marvel Comics are expensive - or wait six months and read it on Unlimited is something I'll decide next month, but for now, I'm excited. 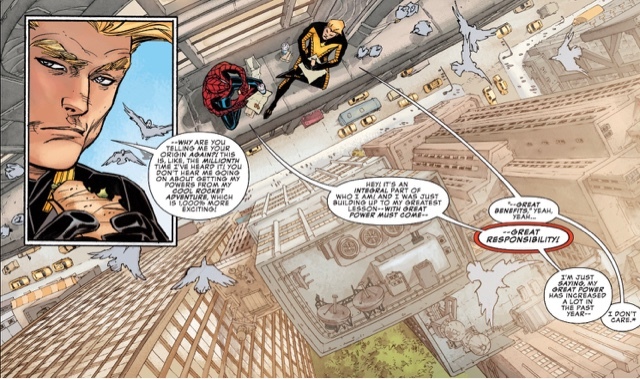 This issue also features a back-up asking the question: why is the Black Widow attacking Peter? We do find out, and I can't say I'm terribly interested. I did, though, like the art of Goran Parlov which, as coloured by Nathan Fairbairn, has a pleasant 'Jazzy' Johnny Romita feel to it. Kubert's Man of Steel homage cover is cute - I like the Parker Luck mustard stain - but a tad dull. Judge this book by the interiors - story and art - which are pretty great. Kubert is the one thing I didn't enjoy about the book, and the colours could've been better and less murkier in certain scenes (I get what Bellaire's going for by making Manhattan actually look like a city, but between that, the Mason's dingy industrial lab and sunset in Chicargo it feels like we're reading through a very dingy book. The heavy shading on Spidey doesn't help at all, and he's a character in full blue and red and neither of those colours pop at all. 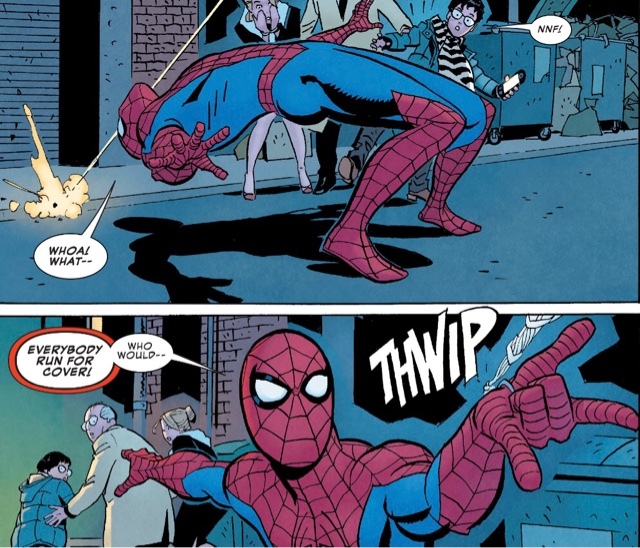 It's even more noticeable when you compare it to the cool but still dynamic colour pallet of Nathan Fairbarn in the back up strip) but he does indeed draw a dynamic, fluid in motion Spidey. 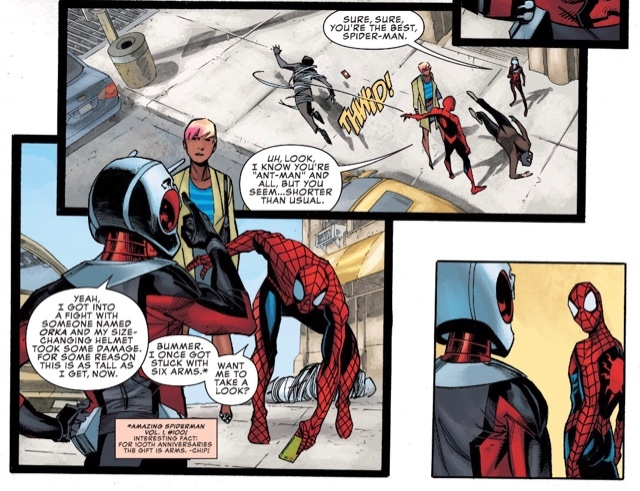 Now if only Marvel would give him his proper boots back, those stupid jodhpur things are atrocious and Kubert drawing them with a fish net pattern breaks from the rest of the costume webs horrendously. But other than all that, great stuff. I'm sincerely interested in seeing where all this is going whereas Slott's constant building towards other stuff burned me out on Amazing. Zdarksy by contrast managed to make this first issue feel full of interesting things without making it feel packed. If Johnny's there for all of it to unfold, all the better! Oh good Lord, Simon, somehow I had managed not to notice the new boots… Talk about horrendous. Is there some story reason for these? Very fair comments on the colouring. She is rather nice, let's hope she's not a supervillain.